Treats in the post day! Being the first week back at work since my holiday, this box was perfectly timed to perk me up! Being back to school time all these treats will travel easily in bags and lunch boxes without being squashed, if you dare to share your treats with your kids that it! If you love tupperware as much as me, you are bound to have those teeny tiny pots that you were once mocked for buying, but have proved endlessly useful! Well most of these snacks are picky style so you could break these down so you could have a mix of munchy seeds and nuts and even pop some mango in a pot and send your kids (or you) with a mix of each. So enough with my food fantasising and let's see what's in my box! Featured a few months ago, this was the first thing I ate out of that box, so we know these are a hit! My crisp and dip obsession was well catered to when I was on holiday. This smaller bag will be perfect for my portion control, as I do need to loose a few holiday pounds, but I can't give up my crisp treats! I was so sad that Honeybuns open weekend was this week as last week I was right on their doorstep. Having this in the box doesn't make me feel so bad that I am missing out on coffee and cake there! Snowy Hills is a lovely ginger and polenta shortbread, topped with lemon sponge. Believe me I thought it was odd when I first heard of it, but it's honestly one of my favourite cakes! The flavours work so well together! Chika's are in this box again this month, but now with some black pepper cashews. I love salt and pepper crisps and I also love cashews, so this is very much like combining the two! This pack has 268 calories so I will more than likely break this down into four portions, as there is a reasonable amount in there for a snack pack style product. Urban Fruit have such fun packaging! This 103 calorie snack pack contains one of your five a day and is just baked fruit. I love these snacks and mango is one I don't think I have tried yet! New to Snackly, these sound like my kind of treat! With a great taste gold 2010 star, these Belgian chocolate coated sunflower and pumpkin seeds with dried appricot pieces sound amazing. Also something I know James won't touch as he isn't a fan of seeds... so more for me! I was hoping and praying that these would make an appearance! I loved the plain shortbread that arrived in the Snackly box a couple of months ago and when I saw that there was choc chip ones on their website, I knew I had to try them! These are firmly in my lunch box as my Monday treat at work to help me get through packing all the boxes! Sorry there is no links this month, I can't work out for the life of me how to do it on the iPad app! I will add them once I'm back on the iMac! 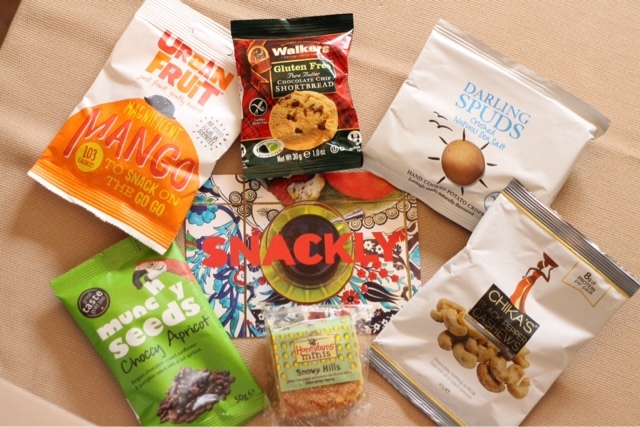 I would love to know what you think of your Snackly box this month and what you're most excited to try!